The development of the motion picture camera in the late 19th century allowed individual component images or film frames to be captured and stored on a single reel of film, and this led quickly to the development of a motion picture projector to shine light through the processed and printed film and magnify these “moving picture shows” onto a screen for an entire audience. When these images or frames were shown rapidly in succession, the viewer had the illusion that motion was occurring, and the exhibition of these moving film reels came to be known as “motion pictures. 35mm film is the basic film gauge most commonly used for motion pictures, and remains relatively unchanged since its introduction in 1892 by William Dickson and Thomas Edison, using film stock supplied by George Eastman. The measurement of 35mm represents the width of the film strip. 16mm film was introduced by Eastman Kodak in 1923 as a less expensive amateur alternative to conventional 35mm film format. 8mm film was introduced by Eastman Kodak in 1932, and Super 8mm film was introduced in 1965. 16mm and Super 8mm film types are still in use today. 35mm is the most common film in Hollywood for making movies, though the 2010 Oscar winner for best film, “Hurt Locker”, was filmed using 16mm film. Older films were made from cellulose nitrate or cellulose acetate stock, while newer films are now made from either a cellulose acetate or polyester base. The film is coated with a light sensitive emulsion made up of gelatin, silver salts and color dyes (magenta, yellow, and cyan). It is this emulsion that captures the individual images, and after processed, yields individual frames in the film strip. A dark brown strip on one side of the film indicates the presence of sound, captured either as a magnetic or optical recording. Film is stored on either metal or plastic film reels. A 3 inch diameter reel holds 50 feet of film; a 5 inch diameter reel holds 200ft, a 7 inch reel holds 400ft, and a 10 inch reel holds 1,000ft of film. Cintrex is able to convert old film types such as 8mm, Super 8mm, Super 8mm with sound, 16mm, 16mm film with optical sound, and 16mm film with magnetic sound…..all to DVD, Blu-ray disc, or to a data file for storage on an external hard-drive or other digital media. For customers wanting to convert their 35mm film, we can still handle this type order, but will outsource the job to a reputable high-end transfer house. Magnetic video tapes are comprised of four (4) materials: 1) a thick plastic or mylar base, 2) a relatively thinner emulsion or oxide that can store magnetic information, 3) a binder to attach the emulsion to the plastic base, and 4) a dry lubricant to help in tape play. Most tape oxides are made of iron, also called ferrous oxides. 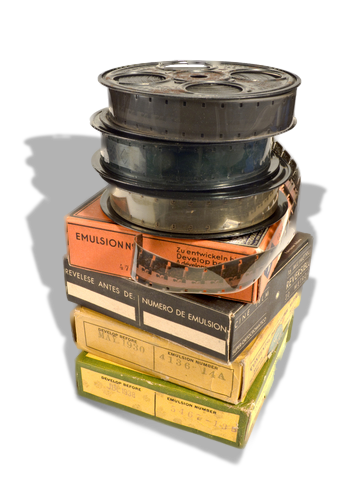 Professional industrial grade video tapes, including the more recent digital tapes, incorporated ongoing improvements into the emulsion, binder, and lubricant components so that they lasted much longer under the stress of repeated use, much better than their home movie market counterparts. The emulsion on the professional grade tapes was made up of higher density iron or chromium oxide metal-formulated compounds, and the binder contained an alumina-silica metal particle coating, both improvements helped in information retention (retentivity) and resistance to demagnetization (coercivity). The added lubricants extended machine head life, and reduced surface roughness, minimizing noise. The oxide or metal-formulation coating on video tapes is strongly affected by magnetic fields. A very simple explanation of the video tape recording process is that small electro-magnetic fields within a video tape recorder or video camera magnetize the oxides on the video tape, leaving permanent magnetized tracks or imprints of information on the tape that can later be read or played back by the same type of machine that originally left the tracks. There are two (2) methods to making a magnetic tape recording, linear and helical scanning. The linear method arranges data in long parallel tracks that span the length of the magnetic tape. Multiple tape heads simultaneously write parallel tape tracks on a single medium. This method was used in early tape drives. It is the simplest recording method, and is how audio was recorded on to audio reel tapes and audio cassette tapes. This method is also used for recording a control track onto video tapes. The helical scanning recording method writes short dense tracks across the width of the tape medium, not along the length. Tape heads (with electro-magnetic fields) are placed on a drum or disk which rapidly rotates while the relatively slowly moving tape passes it. Helical scan recording writes short dense tracks in diagonal manner. This recording method is used by virtually all videotape systems and several data tape formats. On video magnetic tapes, sound is captured in linear tracks while video images are captured in diagonal tracks across the same magnetic tape via a helical scan. Because a video image can have up to 500 times more information than the accompanying sound to a recording, a video tape recording can have 100’s more diagonal imprints in the same linear measurement of tape as compared to the corresponding sound track on the same tape. During the recording process a control track is also placed on the video tape. This control track provides useful information for later playback, including information on proper tracking for alignment between the video tape and the video players’ sensing electronics (audio and video heads), the speed of play, and file names and file types. Sometimes, video tape playback experiences white snow or white horizontal lines that disrupt both the video and audio play, and it becomes necessary to adjust the tracking mechanism within the video player so as to properly align the tape’s control track and the video player’s sensing electronics (or video heads). When you play with the “tracking” control on your VCR, what you are doing is adjusting the skew between the control track and the actual head position on the tape. Usually, this is not necessary, but if a tape is badly worn or stretched you may have to adjust the tracking. Digital Video – digital video tapes were introduced in 1995, and information was stored on magnetic tape using block formats, written to tape in blocks via helical scan. Digital video introduced new characteristics and capabilities because of improved compression and data storage techniques. The blocks contained digital headers, payload, metadata, marker bits, timestamps, and real time transport protocols; and together provided for high definition playback off digital video magnetic tapes. If stored properly, a magnetic video tape can have as long a useful life as well preserved film. Nothing is permanent, but properly made magnetic tape stored in reasonable archival conditions has already lasted over 40 years. Video tapes become useless over time because of poor storage, unintended magnetic erasure, breakage of the container enclosure, and obsolescence of the equipment to access its contents. Always rewind the video tape after use, so as to not leave any section of magnetic tape exposed to whatever environment it is stored in (cassette cases are not airtight or moisture proof) and being rewound prevents the tape from going slack and possibly being damaged during initial play in the future, sometimes after long storage. The storage environment should ideally be “climate controlled”, a cool dark place not subject to fluctuations in temperature, where humidity cannot damage stored video tape. Avoid dust and smoke so as to avoid getting video tape player heads dirty and then contaminating the tape’s surface, causing dropouts and tape damage. Never leave VTR in pause or freeze mode; press the stop button instead so that heads are no longer in contact with the tape and cannot cause any tape attrition. Taking tapes out of storage every 3-5 years and “packing” them, i.e. fast forward and reverse the tapes all the way to redistribute the lubricant on the tape. Broadcast quality tapes have a higher grade of dry lubricant, redistributing this substance can better assure smooth alignment on the cassette reels. Use professional quality video tape cleaning machines that clean tapes to remove dirt, loose oxides, debris, and polishes tape surfaces for better contact; and can at same time inspect tapes to pinpoint wrinkles, creases, and damaged spots, so as to affect early repair or replacement. Provide regular maintenance to video recording and playing equipment, keeping internal systems clean for optimum performance. Magnetic tape continues to be a useful media for recording information in the broadcast industry; and the future of magnetic tape as a storage media for video data was lengthened with the introduction of non-linear methods for retrieving information off magnetic tapes. Below is a listing of various video magnetic tapes, including a picture and short description. Similar to what Cintrex is able to do for Film Transfer, we are able to “ingest” (read and input) contents of consumer and broadcast video tapes, and then convert and transfer the content to DVD or Blu-ray Disc or as data files on external hard-drives or other digital media. DVD’s are used in the transfer of standard definition content found on a majority of both consumer and professional type tapes; while Blu-ray Discs are used in transfer of high definition content on higher end consumer and professional tapes such as HDV, HDCAM, DVCPRO HD. External hard-drives are used for large file transfer jobs requiring more storage space and data file formats. VHS – the most common type consumer video tape; the Video Home System (VHS) tape was developed by Japanese company JVC and launched in 1976. It is packaged within a plastic rectangular shell (7…” × 4” × 1”) and held together with five Phillips head screws. A single VHS tape can hold from 2 hours to 6 hours playing time, depending upon the original recording mode of SP (standard play), LP (long play), or EP (extra long play). BetaMax - is a home videocassette tape recording format developed by Sony, released on May 10, 1975. The cassettes contain 1/2-inch wide videotape and were an early competitor to VHS tapes. VHS-C - is the compact VHS format introduced in 1982 and was used primarily for consumer-grade compact camcorders. Cintrex uses VHS-C adapter cartridges so that the VHS-C tape can be played within a VHS tape player. Camcorder 8mm, Hi8, and Digital8 video tapes – 8mm video camcorder tape was introduced by Sony in 1985 and was continuously improved, resulting in the interim Hi8 video camcorder tape, and then the Digital8 camcorder tape in 1999. With the Digital8 tape, content was encoded digitally, and used a similar format as professional grade video recordings. MiniDV and HDV recording tapes - DV is a compression audio and video format designed for helical-scan magnetic tape media, for the recording and playing back of digital video. It was launched in 1995 with joint efforts of leading producers of video camera recorders, including Sony, JVC, and Panasonic. HDV is a format for recording of high-definition video on DV cassette tape. This format was originally developed by JVC and then supported by Sony, Canon and Sharp. Most HDV camcorders use “small” DV cassettes also known as MiniDV cassettes. A standard MiniDV cassette provides one hour of recording. Large DV cassettes can deliver up to 4.5 hours of recording time. MiniDV’s are still in regular use today for the transfer and storage of digital video. MicroMV - MicroMV was a proprietary videotape format introduced in 2001 by Sony. This cassette is physically smaller than a Digital8 or DV cassette. In fact, MicroMV is the smallest videotape format — 70% smaller than MiniDV or about the size of two US quarter coins. Each cassette can hold up to 60 minutes of video. ¾” U-matic - U-matic is a videocassette format first developed by Sony in 1971. It was among the first video formats to contain the videotape inside a cassette, as opposed to the various open-reel formats of the time. The videotape was ¾ inches (1.9 cm) wide, so the format is often known as ’three-quarter-inch’ or simply ’three-quarter’. U-matic was named after the shape of the tape path when it was threaded around the helical video head drum, which resembled the letter U.
Betacam - Betacam is a family of half-inch professional videotape products, first developed by Sony in 1982. All Betacam variants from (plain) Betacam to Betacam SP and Digital Betacam use the same shape cassettes. The cassettes come in two sizes: S and L. The format supplanted the three-quarter inch U-Matic format. In addition to improvements in video quality, the Betacam configuration of an integrated camera/recorder led to its rapid adoption by electronic news gathering organizations. Betacam SP tapes were the first to use the newer composition of metal-formulation emulsion and strengthened binders to provider greater durability under stress of repeated use. Many library collections still use professional broadcast tapes as their preferred storage media for long time archival storage purposes. Betacam SX - Betacam SX is a digital version of Betacam SP introduced in 1996, positioned as a cheaper alternative to Digital Betacam. It stored video as MPEG-2 files. DVCPRO – DVCPRO is a variation of DV developed by Panasonic and introduced in 1995 for use in professional broadcast news. DVCPRO tape recordings featured “locked” audio, with the audio sample clock (the digital time reference used in the sampling process) precisely locked to match the video sample clock such that audio and video outputs were always in sync to provide better quality broadcast recording and playback. DVCAM – In 1996 Sony responded with its own professional version of DV called DVCAM. Like DVCPRO, DVCAM used locked audio, which prevented audio synchronization drift that could happen on DV recordings. HDCAM - introduced in 1997 by Sony, was the first HD high definition format available in a Betacam form-factor, and featured HD recordings with 1080i resolution at 24 frames per second. DVCPRO HD – introduced in 1997 by Panasonic was similar to HDCAM, but provided HD resolution in 720p and 1080i at 24 to 60 frames per second. The form factor was the same as the DVCPRO tape cassettes. Two additional tape formats to mention, both of them open reel videotapes, not enclosed in a cassette case as the other formats above. There is the is the oldest of all the tapes reviewed in this section - the 1 inch Type C is a professional helical scan open-reel videotape formats co-developed and introduced by Ampex and Sony in 1976. It became the de facto standard for professional video and television broadcast industries until the introduction of Betacam, DVCAM, and DVCPRO video tape recording and play systems. Customers still bring in this type for transfer and conversion. Another open reel video tape format is the Sony EIJ-A; this format offered black-and-white (and later color) video recording and playback on 1/2” magnetic tape on a 7 inch diameter open reel. DVD’s, first introduced in 1996, are optical discs played inside standalone DVD players or within computers with internal DVD players. The Cintrex DVD format is a DVD-R with MPEG-2 compressed video and audio, wrapped within a VOB (video object) container format. This type of DVD is playable in 99% of the players in theUSA. DVD’s can contain up to 2 hours movie playing time, or up to 4.7GB of data. Our standard DVD’s are Taiyo Yuden, 16x recording speed, with a white inkjet printable surface. This type DVD disc is recognized as one the best in the industry, and has an advertised storage shelf life of 70 years. As an option, Cintrex offers a Kodak Gold Archival DVD, with an advertised shelf life of 100 years; this DVD has an inkjet printable surface. Blu-ray optical discs or BD’s are the same size as DVD’s, but hold five times more storage capacity due to the shorter wavelength blue-violet laser used for reading and writing data onto the disc’s surface. (DVD’s are recorded using a longer wavelength red laser.) The Blu-ray format was developed to enable recording, rewriting and playback of high-definition video (HD), as well as storing large amounts of data. BD’s are played either on standalone players or on drives inside computers. BD’s are made to be scratch resistant, an advantage over the typical DVD. Blu-ray is becoming more and more popular; and is currently supported by about 200 of the world’s leading consumer electronics, personal computer, recording media, video game and music companies. About 15% of theUSmarket has Blu-ray players in their homes. The standard Cintrex provided Blu-ray Disc or BD will hold up to 8 hours of standard definition (SD) film transfer, or 3.5 hours of high definition (HD) film transfer, or 25GB of data. Our BD disc format follows the standard UDF (Universal Disk Format) for readability in both standalone players and computer drives; and contains MPEG-2 and H.264/MPEG-4 files, with the audio and video streams multiplexed and stored in a container format based upon the industry standard MPEG transport stream with the filename extension .m2ts. We are currently using BD’s manufactured by Verbatim and Falcon, 6x recording speed, single layer, 25GB capacity, with a white inkjet printable surface, and a hard-coat ScratchGuard recording surface. BD’s are also being considered as a viable long term storage option, with the dual recording layer BD’s offering up to 50GB of data storage (the equivalent of 10 DVD’s on one disc). Blu-ray disc’s store well and provide years of data retention, advertised to last beyond 20 years. M-DISC is an archival disc made by Millenniata that is rated to hold its stored content for up to 1000 years. The M-DISC is manufactured of inert materials and the disc surface holds its information in “pits” etched into the surface by a powerful laser. The pits do not fade with time, as do the markings on dye covered surfaces found on DVDs. External hard-drives are increasing in storage capacity and becoming less expensive in price. An external hard drive is the best storage media for large media content transfer projects, and is available in storage capacities up to 3TB. Some families choose to transfer their entire family library of film, video, slides and photos; and a hard-drive offers the storage capacities to fit the size requirements of such transfers. Hard drives must be properly formatted for the type of computer operating system that customers will use for file editing and viewing. Hard drives need to be set to either Windows NT File System (PC) or Mac OS Extended (Apple/Mac). Data files from SD and HD transfer can become very large in size, from 13GB to 25GB in size for a one hour film or video file. Cintrex is able to configure customer provided hard-drives for storage, or can provide new hard-drives, depending upon customer preference. Cintrex through its retailers can offer customers a tape backup to Ultrium LTO-6 and LTO-5 tapes as part of our digitization and conversion process. Since 2002, LTO tapes have been the best selling “super tape” format and is widely used with small and large computer systems, especially for backup. The LTO-5 tape can hold up to 1.5TB of video and LTO-6 tapes up to 3TB of digital content. Families wanting additional storage options beyond DVD, Blu-ray Disc, or external hard-drive, may choose for the tape backup, especially if it is also hosted at a remote site (such as at a Cintrex backup facility). This option offers redundancy and protection for valuable family archives.